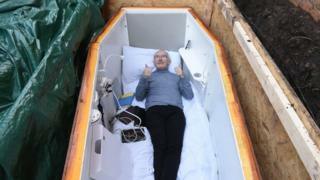 For many people, the thought of being buried alive is the stuff of nightmares but one Irishman is going three feet under for three days – and nights. 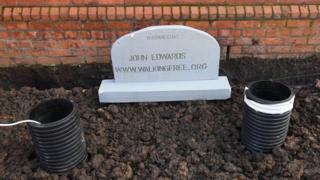 Dubliner John Edwards volunteered to lie in a coffin which was then sealed and buried in the grounds of an east Belfast church. But he’s not alone down there – the coffin has been specially adapted so he can broadcast live on social media. His aim is to reach out to those in despair. Mr Edwards, 61, is former drug addict and alcoholic who has been sober for more than two decades. After experiencing what he described as an “incredible encounter with God 27 years ago”, he set up a number of Christian rehabilitation centre and homeless shelters. Having lost more than 20 of his friends to addiction and suicide, Mr Edwards now counsels and prays with people in distress or despair. For the next three days, his message of “hope” is coming from beyond the grave in the grounds of Willowfield church in east Belfast. He has been taking calls, texts and emails from members of the public who are seeking help. “My plan is to speak to them from the grave before they get there and show them hope,” he told the Belfast Telegraph. 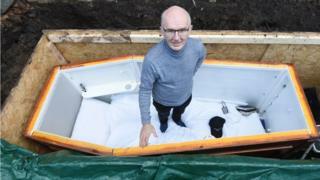 Mr Edwards said he is not claustrophobic but was still a little apprehensive about being buried alive. “When the lid is closed and you’re underground, and you hear the soil getting thrown on top of the coffin… it is freaky,” he admitted. The wooden structure is more spacious than the average coffin, being 8ft long, 3.5ft high and 4ft wide (2.4m x 1m x 1.3m). It is equipped with a caravan toilet and access to air, food and water supplies are maintained through pipes. It is not the first time Mr Edwards has been early for his own funeral. 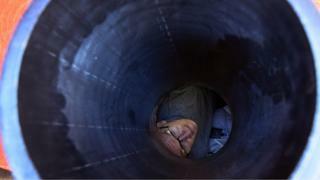 He spent three days buried underground in his adopted town of Halifax in England last year. The Dubliner has also been physically close to death on several occasions. Having experienced sexual abuse, mental illness and homelessness, the former drug addict said he overdosed a number of times. He also underwent a liver transplant after developing Hepititis C from a dirty needle, and has survived cancer twice. 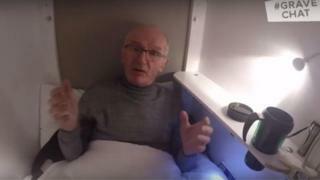 He admitted his habit of being buried alive is a “bit of a gimmick” but said it was one with a serious message.